The contest is open to all the undergraduate and graduate students in PIEAS. Any article having excessive violence, vulgarity or religious extremism determined by the judges, will not be considered. Decisions of judges will be final and unchallengeable. One can participate in Article writing and Dialogue writing competition at a time or Story writing and Dialogue writing at a time, since Article and Story Writing will run in parallel. 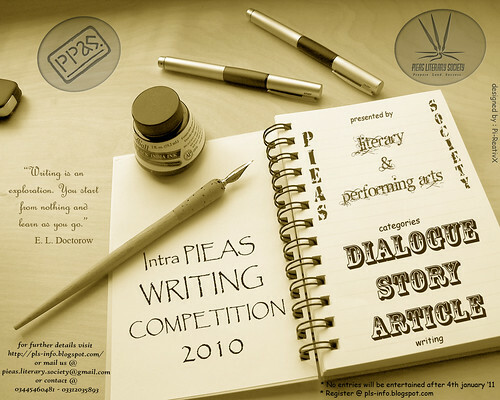 Article Writing and Story Writing Competition will be in Urdu and English language as separate competitions. Whether Dialogue Writing Competition will only be in Urdu. · Initially participants will be given 7 topics for article writing. · Each participant will have 20 minutes to write outlines of all 7 topics. · After 20 minutes, 2 out of 7 topics will be selected by draw. · Participants will be given 10 minutes to fine tune the outlines of 2 topics selected though draw. · Each participant will have to write a complete article of 500 to 700 words on the final topic within 40 minutes. · One outline will be given to participants. · Lead of the story will be provided. · Participants will have to complete the story within 50 minutes. · 3 scenarios will be given to participants. · Scenarios will be in Urdu language. · Participants will be given 15 minutes for each scenario. · A dialogue should not exceed 8 switches. An Inspirational video by ~Fine Arts Wing~ about the most realistic paintings of Iman Maleki. The intra-PIEAS Arts Exhibition was a successful event and the need was felt to organize more such events to promote the culture of art in PIEAS. The new framework of PLS had been finalized and the members were sorted into the Wings according to the preferences given in the forms and the evaluation by the Heads of each Wing. The lists have been posted on the blog and any objection should be made by 20th of December. Any objections should be notified immediately at pieas.literary.society@gmail.com. If any member wants to be part of Essay and Story Writing or Living on the Edge Team, he/she may notify at pieas.literary.society@gmail.com. However, it is notified that organizers of events shall not be allowed to participate in the respective event. A PLS Fund shall be created. Members shall be required to deposit Rs. 50/-per month into the PLS Fund. The fund shall be used to cater immediate needs such as stationary etc before events or for posters. Members were notified that three consecutive absences from meetings shall lead to cancellation of membership from PLS. In case a member is unable to attend a meeting, he/she is required to notify beforehand so that the meeting shall be re-scheduled if deemed necessary. The members shall now communicate to their respective Heads for any suggestion or notifications etc. Heads shall be evaluating each member and are responsible for selecting teams for each event. In case a member feels that the Head is not responding accordingly, he/she may contact the President or Information Secretary so that the issue may be resolved. Members are requested to keep their personal conflicts out of society. The PLS blog has been created. Any further notices shall be posted via the blog. Also the blog shall serve as a forum for members to discuss issues, post suggestions, finalise events and make announcements. All PLS members are advised to fill out the forms available on the blog and submit their details as soon as possible so that their details may be stored in PLS Database. New PLS members selected through PLS Inductions 2010 were also announced. Few inductees have been added to the volunteer list. Their performance shall be assessed in the first upcoming event and their membership status shall be decided on their evaluation. The intra-PIEAS Arts Exhibition has been postponed to after Eid-ul-Azha break. Meanwhile any submissions of art pieces are welcome to be displayed in the Exhibition. The new framework of PLS has been finalised. The updated structure consists of four wings namely Literary Wing, Pi-Reativx, Organising Wing and Fine Arts Wing. Members shall be sorted into the wing by their preferences and evaluation by the Heads of the Wings. The suggestion of membership fee was put to the members. The membership fee shall be considered as a fund for any society events. The finalised decision shall be notified via email and/or the blog. Head Literary Wing Mr. Adeel Ashraf briefed the members about the events under the Literary Wing focusing mainly on the magazine. The magazine shall be issued monthly (InshAllah) and one issue shall be printed on an annual basis. The magazine shall cover a wide range of topics and shall comprise of an English section and an Urdu section. Any suggestions about the title, logo, cover page, theme or any other ideas related to the magazine are welcome and can be posted on the blog. Also articles, proses, comics/cartoons, or any other pieces of writing that may be included in the magazine are welcome and can be sent via e-mail or may be posted on the blog.